A flight from Manchester to Cyprus was forced to divert to Turkey after the co-pilot died during the journey. 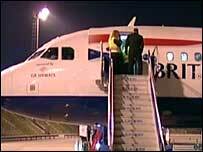 First Officer Michael Warren, 43, was taken ill during a GB Airways flight to Paphos on Sunday afternoon. The Airbus A320, with 156 passengers on board, was re-routed to Istanbul where travellers spent the night. A spokeswoman for GB Airways, which is a franchise partner of British Airways, said that at no time were the passengers and crew in any danger. Mr Warren, a father-of-two from Ormskirk, Lancashire, was given first aid by the aeroplane's purser, but was pronounced dead by the Turkish authorities on arrival in Istanbul. The spokeswoman said: "The flight, with 156 passengers and six crew members, left Manchester on time at 1420 on Sunday, 24th February. "Michael became ill during the flight. The purser administered first aid while the captain diverted the aircraft to Istanbul, where it landed at 1945 local time. "Paramedics attended the aircraft immediately. Sadly, Michael was pronounced dead by the Turkish authorities. "Our thoughts and condolences are with his wife and family following this tragic news." 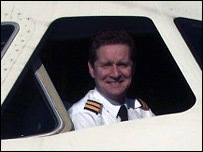 Mr Warren, a former RAF pilot, joined GB Airways in August 2005. Passengers were told of a medical emergency on the flight deck upon touch down in Istanbul and spent the night in the city. They are expected to be flown to Cyprus later.